From New Brunswick? Study Canada's most up-to-date medical curriculum in your home province. Get involved in one of the many extracurricular activities at DMNB from sports to choir, meditation to journaling. Join our volunteer patient program and play an essential role in training our student physicians. Learn about the groundbreaking biomedical research being done at DMNB in cardiovascular and occupational medicine. 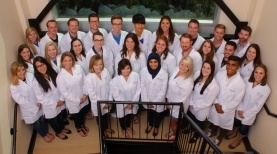 Dalhousie Medicine New Brunswick admits 30 New Brunswick students each year, giving them the opportunity to study medicine in their home province at various teaching sites. You must be considered a resident of New Brunswick and meet the place of residence criteria to be admitted into Dalhousie Medicine New Brunswick.